Today’s business environment demands reliable access to information and knowledge in order to take decisive action when securing company resources. Optimum Security has a highly trained and experienced team comprising investigators, security management, and legal professionals who work together to build a solid security system around the client. 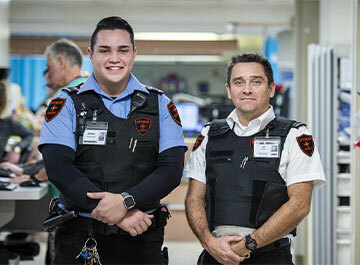 We strive to continually improve our security guard service programs to keep delivering security, consulting, investigative and training solutions that are specific to the unique needs of our clients. Our security consulting services are available to companies and corporations in different sectors, including finance, retail and industry. For companies that have an existing security system, we can provide a thorough, subjective assessment of the program, including an expert analysis of the physical and financial vulnerability of the company. Our security experts can then give you a detailed report of areas that need improvement and recommend practical solutions to improve your security. And other areas of concern that surface during the security evaluation of your company. The security decisions you make today regarding your organization will determine how resilient it will be when security threats emerge later on. Our comprehensive management consulting services aim at providing decision makers with useful information so you can feel more certain about the steps you take to safeguard your employees, work community, assets, operations and facilities. With decades of experience in the industry, our security experts can help high level managers establish a robust security environment through services that include policy review and development, current and emerging threat assessments, and master planning. Optimum Security offers a combination of security consulting services and private investigator software that businesses can use to solve intricate cases and get a thorough and informative report of facts. By combining conventional investigative techniques with cutting edge technology, our investigator services can dramatically reduce the level of uncertainty of decision makers when confronted with serious security issues. Our holistic approach to security is based on real-world experience and time-tested practises that can be replicated across industries with the same level of dependable results. An integrated security framework has been proven to deliver stronger and more cohesive security to manage internal and external threats to your organization. Still, Optimum Security finds it necessary to conduct thorough investigations of all components when assessing vulnerability threats. Our comprehensive risk analysis process looks at your current security plans, operational protocol, physical response capability, and crisis management plans, before recommending the necessary changes. We play an active role in implementing the proposed security measures, and upon your approval, attempt an actual breach of your security to test the response capabilities. This will be followed by an analysis, report, and further improvements if need be.